The Austin-Healey 100M was released In 1955. A factory built, limited edition version of the Healey 100, fitted with performance modifications that Healey had used on their racing cars for the 1953 Le Mans 24 hour race. Visually the M differed from the standard 100 with its racey bonnet louvers and bonnet belt. Under the skin, the front suspension was stiffened and the 2.6 cylinder engine fitted with larger carburettors, a cold air box, high-lift camshaft and 8.1:1 compression pistons, increasing the power to 110 bhp. A Le Mans engine modification kit was also available that could be retro-fitted by Austin dealers or technically-minded owners and brought standard Austin-Healey 100’s up to 100M engine-spec (excluding the high compression pistons). In total, 640 100Ms were built by the factory between September 1955 and July 1956 (all BN2 series cars). Cars fitted with the Le Mans kit aren’t to be confused with the 100M. The 100M moniker is reserved for factory-built cars built in the original 640 production run. 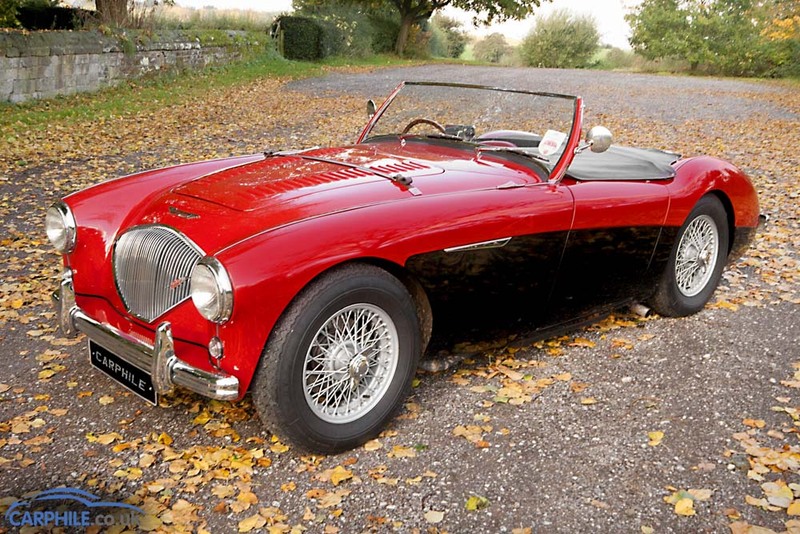 This rarity makes the 100M one of the most sought after of all Austin Healey models.